Upon arrival at Bangkok airport we meet & greet and transfer to your hotel in Bangkok. The rest of the day is free for you to settle into your hotel and relax, or start exploring the local area. Our tour begins with a a fun way to discover Bangkok’s unmistakable ‘Kwam-Pen-Thai’ (Thai-ness) as we take to tuk tuks and long-tailed boats for tours of the Grand Palace, Buddhist temples including Wat Po, the old canals of Thonburi and the iconic temple of dawn, Wat Arun. Local legend has it that the shards of pottery decorating its 79 m tall spire came from a nearby shipwreck 100 years ago. Overall we aim to make sure the true Bangkok is uncovered. Leaving Bangkok this morning we travel to the historic town of Kanchanaburi. Originally founded to protect Thailand from the Burmese the area is known today for being the site of the famous Bridge Over the River Kwai. Occupied by Japanese troops during WWII the bridge and subsequent railway line was built by allied prisoners of war. Travelling by train along the bridge we will also visit the Allied War Cemetery and the local museum. Then we travel by long-tail boat to our overnight accommodation in rafthouses. After breakfast we head for the beautiful Erawan Falls National Park. This huge park is home to ancient caves and the spectacular waterfalls named after the 3 headed white elephant found in Hindu mythology. We depart Kanchanaburi this morning for the short trip to the former Siam capital of Ayutthaya. Now a UNESCO world heritage site the city flourished between the 14th and 18th centuries and is home to many ancient temples and Palaces. This evening we board the overnight train to Chiang Mai. We arrive into Chiang Mai this morning where the rest of the day is free to explore the city. Nestled amongst some of the highest mountains in Thailand, Chiang Mai retains a relaxed feel to it. Head to the impressive local zoo or visit one of the nearby Buddhist temples before dining out in one of the city’s many restaurants. Leaving Chiang Mai this morning we travel to the colourful market at Mae Malai before carrying on to the lush Pang Lan Waterfalls. After lunch we begin our trek into the Huay Nam Dang National Park and walk on to the traditional Karen village of Baan Mae Jok where we stop for the night in order to learn more about the culture of the local hill-tribes. Awakening to cool mountain breezes we enjoy breakfast this morning before we trek on through the tropical jungle to the village of Baan Pa Khao Lam. Climbing aboard Thai elephants we experience these majestic creatures up close as we continue our journey through the landscape until arriving later today at the rafting camp. 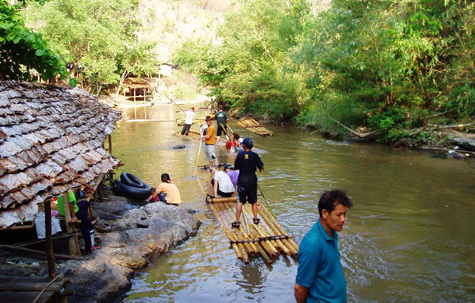 On our final day in the jungle we experience bamboo rafting along the Mae Tang river. Cruising along the tropical riverbanks in our bamboo rafts we make stops at small tribal settlements before finally arriving into Shan village where we transfer back to Chiang Mai. Today is kept free to relax after the trek. You could take in a local Thai cooking course, explore the markets and alleyways of Chiang Mai on foot or relieve any tired muscles with a relaxing local massage. Transfer to the train station for the overnight train to Bangkok. We arrive back into the Thai capital this morning and transfer to the hotel. The rest of the day is free to explore Bangkok at your leisure. Visit the lively area around Patpong, drop in on a snake farm or browse round Bangkok’s many modern shopping centres. We use a range of carefully selected hotels for our group departures. If you have specific requests for hotels, please ask for a tailor-made tour.